Community Garden of Fox Lake | Welcome to Promote Fox Lake! Welcome to Promote Fox Lake! Progress in the community garden is happening quickly and right on schedule. As you can see we have a wonderful addition in our garden donated by Promote Fox Lake. The gazebo will be used for collaborative cooking classes, nutritional classes and just a beautiful place to sit and relax. Special thanks to Mike Valenziano and his team for donating his services and time completing the installation of the gazebo. 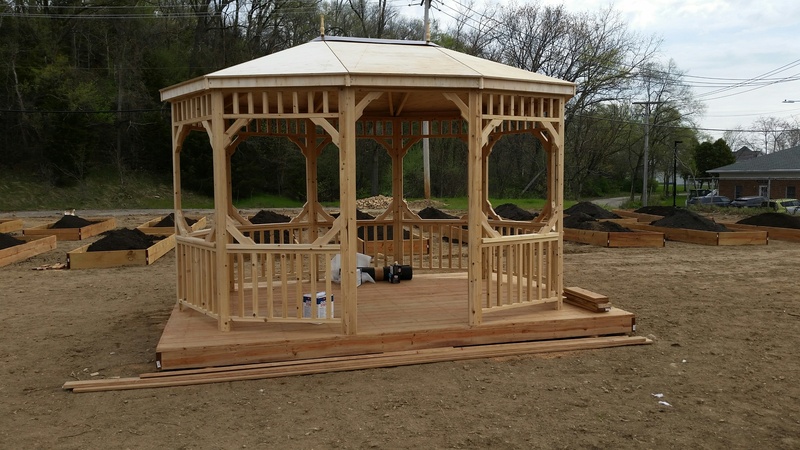 Check out the finished gazebo! The gazebo that Promote Fox Lake donated was the stage for the Community Garden of Fox Lake grand opening event held on June 18, 2016. Promote Fox Lake is very proud to have been a part of this beautiful public community garden in the heart of downtown Fox Lake.